Here’s an emergency repair I did for a Leslie 122 cabinet. The fast / slow relay had died, and I needed to find a solution with parts from Maplins! The fast / slow replay relay switching is quite interesting in the 122. The cabinet is connected to the organ by a 6 pin connector, however as the audio signal to the cabinet is balanced, there is no spare pin for switching the relay. The way around this is that a DC voltage is superimposed on both terminals of the audio signal. As the input is balanced this is a common mode signal and thus not amplified by the 122 (see schematic below). This DC level is typically 60-100 VDC. This is applied to the grid of a 12AU7 that energizes the relay. The relay had died (due to a Leslie motor shorting out), and needed replacing. 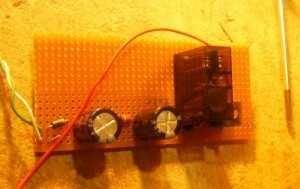 I couldn’t source a direct replacement, so used a DPDT 6V relay which could switch 240VAC at 5 A. As I only needed a SPDT relay I paralleled the two switches for extra current handling. I derived the power for the relay from the filament supply to the valves in the 122 amplifier; the relay only draw 83 mA which will not have any effect on the filament winding. To switch the relay I used a TIP31 NPN transistor which will turn on when a positive voltage is applied to the base. I limited this voltage with a 47k resistor and a 12V zener. This entry was posted in Amp repair, Hammond organ, Leslie cabinet. Bookmark the permalink. Post a comment or leave a trackback: Trackback URL.